Is this the funniest, most bizarre Thanksgiving Costume ever? In 2011, American actress and reality TV star Tori Spelling dressed up her six-week-old daughter Hattie in her own personal turkey outfit surrounded by faux vegetables for Thanksgiving. 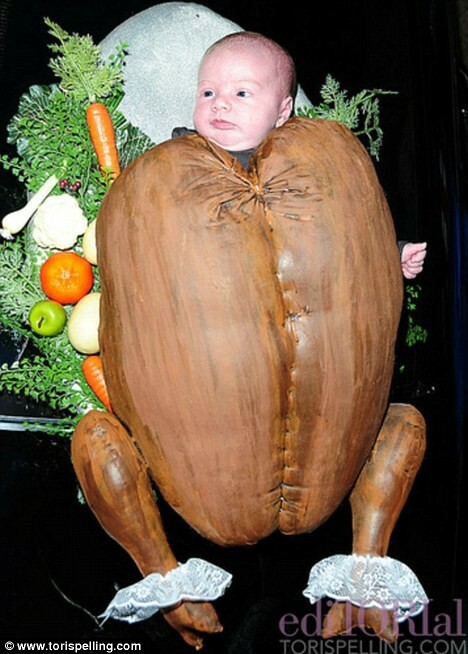 Under the caption ‘Roast Turkey Costume,’ the star blogged about how to create a similar outfit for your baby. ‘Ok, this one isn’t edible, but if you have a baby at home, here’s a fun Thanksgiving craft project you can make for what will be very memorable holiday photos,’ she writes.